Paul Ryan's been coaching other Republican lawmakers to sell the $1.5 billion tax cut to voters, and telling people on Twitter to check their paychecks for wage hikes. The bill - which was deeply unpopular when it passed along party lines in December - is now breaking even in a new opinion poll. 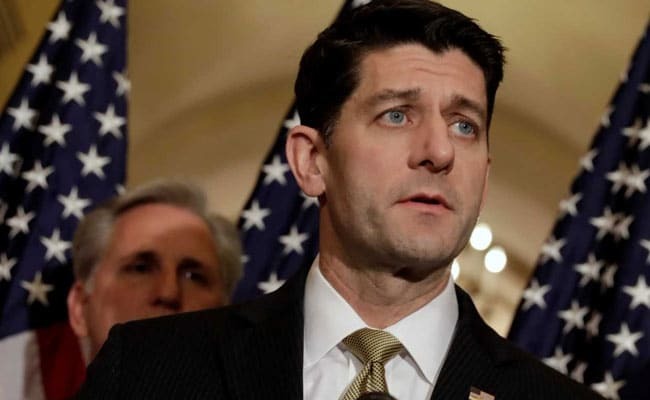 Never mind all the Democrats who call the GOP's tax bill a deficit-busting giveaway to the rich; House Speaker Paul Ryan, R-Wis., has been enthusiastically promoting it as a middle-class tax windfall. He's been coaching other Republican lawmakers to sell the $1.5 billion tax cut to voters, and telling people on Twitter to check their paychecks for wage hikes. The bill - which was deeply unpopular when it passed along party lines in December - is now breaking even in a new opinion poll. So Saturday morning, by way of good news, Ryan's Twitter account shared a story about a secretary taking home a cool $6 a month in tax savings. "Julia Ketchum, a secretary at a public high school in Lancaster, Pennsylvania, said she was pleasantly surprised her pay went up $1.50 a week. She didn't think her pay would go up at all, let alone this soon. That adds up to $78 a year, which she said will more than cover her Costco membership for the year." The tweet was deleted within hours, probably guaranteeing it will never be forgotten, and leaving people baffled as to why Ryan ever thought it would make a good advertisement for the tax plan's supposed middle-class benefit. While it's true that the bill is stingy for people at the very bottom of the pay scale and showers money on those at the top, it does include substantial savings for millions of workers in the middle class. Estimated annual savings range into the thousands of dollars, which is certainly a lot more than a$60 Costco membership. Neither Ryan's office nor Ketchum could be reached for comment. Not that hundreds of people dragging Ryan over his tweet seem that interested in finding out. While it's hard to be sure, since President Donald Trump refuses to release his income tax records, The Washington Post has written that he stands to save millions of dollars through the bill he promoted and signed. Likewise $1.50 vs. $500,000 - the latter amount being what GOP financier Charles Koch and his wife reportedly donated to Ryan's fundraising committee days after the tax bill passed. All of which is to say that even if Ryan's tweet was only up for a few hours, jokes aside, it could end up haunting Republicans in the November election.